Los Angeles, CA – On a clear Sunday evening, dozens of people gathered for a star studded Breakthrough Series Red Carpet event with a night of talented artists including LA “IN” PR’s own Melanie Taylor, Torrey Mercer, and Cheating Daylight, plus other great artists including Y LUV, Chelsea Perkins, and Lora McHugh. The event was hosted by Nic Creznic and Mikey Jayy of the Artists In Music Awards held at the World Famous LA venue, The Joint. What made the evening most unique, it had a Halloween Costume theme. The Joint was decorated for the occasion and dozens of people dressed up to fit the atmosphere in hopes to win the Best Costume contest. Even Torrey Mercer dressed up as Rapunzel and a few band members of Y LUV dress up, including one with a dinosaur mask and the other in a Superman costume. There was not an empty seat in the house, even as the evening progressed with each act, the crowd of young and old stayed for nearly the entire event. Dressed in a hazardous waste chemical suit, Host Nic Creznic introduced each act starting with the showing of Lora McHugh’s music video, “Wolf In Sheeps Clothing”. The young Pop artist took the stage and played a 3-song set. Hitting notes as high as she could, she had the audiences’ full attention. The second act was another Pop artist, the beautiful Chelsea Perkins. Her set began with a very impressive video called “Forbidden Fruit”, which premiered to the public for the very first time that night. She also followed her video with a most impressive 3-song set and she gave the audience a live performance of her single, “Forbidden Fruit”. The third act was LA “IN” PR’s very own Torrey Mercer. Like the previous artists, her set began with her music video, “Looking Glass”. “Looking Glass” is also the song that won “Best Pop Song 2013” at the Indie Channel Music Awards. Torrey’s song is also Nominated for “Single of the Year”, she’s Nominated for “Best Pop Artist Female” at the 23rd LA Music Awards, and she currently has four Nominations at the 2014 Artists In Music Awards for Best Pop Artist, Best Singer/Songwriter, Best Teen Artist, and Best Teen Pop Artist. Dressed as Rapunzal, Torrey performed three songs including her award winning song, “Looking Glass”. Next in the line-up was an Alternative artist from Orange County called, Y LUV. Y LUV is a seasoned professional Independent band. This year alone, they’ve performed at 63 shows all over the United States in various bars and festivals and even performed with The Rolling Stones, Mumford & Sons, Artic Monkeys, and Vampire Weekend. To have them perform at The Joint for this awards event was a major treat. Native to Vacaville, near Sacramento California, was award winning Rock artist, Cheating Daylight. They were the fifth act of the evening. Prior to their set, Nic Creznic and Glitter Rose presented Spokesman and Advocate for Breast Cancer Awareness, David Harrison Levi with the Nomination for Humanitarian of the Year. Cheating Daylight performed three songs from their latest album, Road to Somewhere including their crowd favorite “Walls”. Cheating Daylight is Nominated for several awards at the 2014 Artists In Music Awards including Best Alternative Artist, Best Rock Artist, Best Indie Artist, and they are the reigning winner for Rock Artist of the Year at the LA Music Awards and Best New Artist at the 2013 Malibu Music Awards. After Cheating Daylight’s amazing performance, the winner for Best Costume was announced. Several contestants took the stage and the audience cheered for the best dressed. The winner was an unknown couple dressed in 17th century European masquerade costumes. They walked away with a gift bag provided by St Jude Children’s Research Hospital, which included a backpack, two t-shirts, and $50 cash. The headline and final performer of the Breakthrough Series Event was none other than, Pop Artist and the 2013 Best Dance Artist, Melanie Taylor. Immediately following the contest, the audience got to view Melanie Taylor’s brand new music video of “Walk of Shame” and she closed the show with three songs including her singles “Cease Fire” and “Walk of Shame”. Her performance was so impressive, the audience cheered for an encore. Melanie cordially accepted the audiences request and played the song, "Unite". 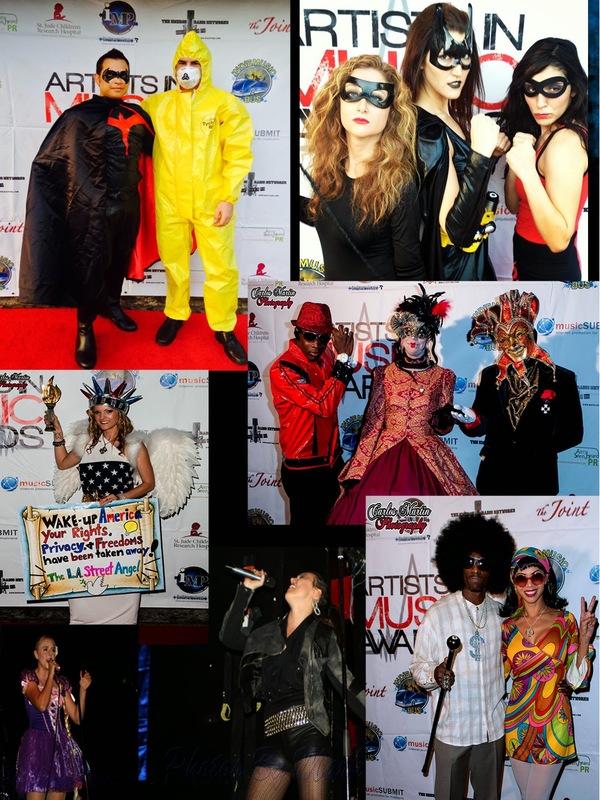 Look for more amazing performances by LA “IN” PR artists Melanie Taylor, Cheating Daylight, Torrey Mercer, and Glitter Rose at the Nomination Event coming up at the Artists In Music Awards on December 15, 2013 and at the main awards ceremony on February 7, 2013.